Well, seems like I was missing quite a lot. The episodes are heavily knitting, but each one has a segment entitled ‘Crochet Corner’ with Kristen Omdahl. From the beginning, Kristen starts with the basics of crochet. From there, she moves to more complex crochet. But, don’t overlook the knitting segments even if you’re not a knitter (which I’m not). There is still useful information there for crocheters – information about yarns, about style and fit, about color. I find the shows to be well produced and enjoyable. Wish I got the TV show, but that’s not happening as I only have the most basic cable program. So, instead, I’ll be relying on these satisfying DVD’s. Is this Multi Crochet and Knitting Tool To Good To Be True? I do get this show and love it. I’ve tried to join the website several times, but never receive the verification email in my box or the spam box. Call us at Customer Support, 866/949-1646, between 8 and 5 MDT Mon-Thurs, 8 and 3 Fri. Your ISP may be blocking the confirmation email. We can “push” your account over to “approved” and then you’ll have access. If those aren’t convenient times to call, email us at customerservice@interweave.com. 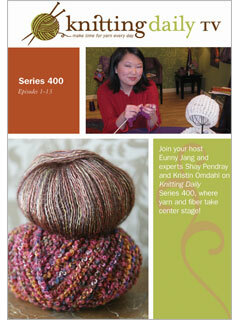 Knitting Daily is shown on PBS stations, but each station decides if they will show it and when. If you want to have it in your area, call your local PBS station and let them know! slo-mo is too speedy for me to catch. Also, not knowing alot about knitting doesn’t help. Show is fab & I hope it continues! Thanks! I’m not a fan I think they try and cram to much into one show and no one learns a thing. All the guests way to much for one show.